Looking for Medals, Crucifixes, and Twine for making all-twine knotted Rosaries? 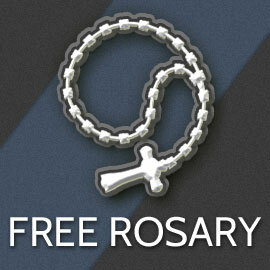 Rosary Army doesn’t provide supplies, but because we give away our Rosaries for free, and we depend on people like you to donate Rosaries, we’ve done our best to find the least expensive vendors for twine and Crucifixes. Please note that Rosary Army receives no proceeds from sales of twine, Crucifixes, starter kits or other supplies and we have no official affiliation with any of these suppliers. We merely offer these links for your convenience. For questions regarding products or purchases from these companies, please contact them directly. For current prices and color selection, please be sure to visit the separate websites for the various twine providers as Rosary Army’s list will only be updated a couple times a year. Memphis Net & Twine Co.
For current prices and color selection, always be sure to visit the vendor’s website. If you’re not ready to commit to an entire spool of one color, visit this site for pre-cut rosary length twine in a variety of colors. We order most of our medals and Crucifixes from Our Lady’s Rosary Makers or Autom Online Catalog because they’re the least expensive distributors we’ve found of bulk religious items. Note: OLRM offers a great .14-cent metal Crucifix that is great for all-twine knotted Rosaries, but requires a separate metal jump-ring that must be attached manually to each individual Crucifix. Catholic Parts sells several mission crucifixes, including some styles with jump rings included from $0.17 each. Note: Please note that Autom has expensive shipping charges, and many of their items are often on back order. But some of our favorite rosary crucifixes they sell are the Metal San Damiano Crucifix 50/pack, Flared Crucifix 50/pack and the Metal Liturgy Crucifix 50/pack. Just search those names in Autom’s online search tool. Here you can find black plastic crucifixes in bulk if you are interested in making rosaries specifically for the military and wish for Rosary Army to provide them on your behalf.